Previously, users were able to -- perhaps too quickly -- commit to an in-app subscription by tapping on a button and confirming the purchase with Face ID, Touch ID or passcode. 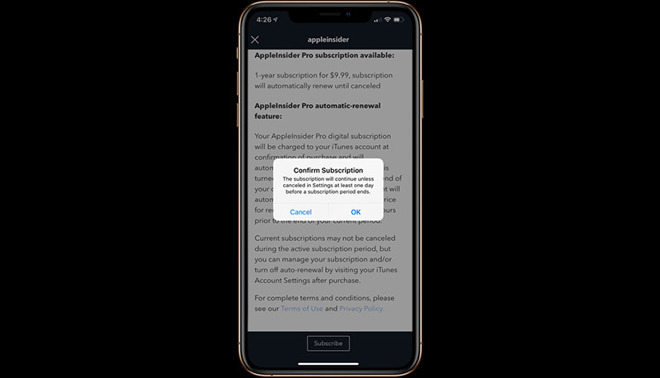 Now, tapping the same button brings up the usual App Store purchase prompt, but further requires users to interact with a follow-up confirmation window before the subscription is processed. This seems like a good change, though it could be improved by including the billing amount and frequency (eg. $3.99 billed every 30 days), just to make it totally clear what you're saying OK to, without having to cancel back to read the fine print. This is good. Very good. Especially for Family Sharing. My grandson repeatidly and unknowlingly opened "free trial" subscriptions that would, if not cancelled, convert into a $100 a year subscriptions. And, not one of them would open as a cheap monthly subscription and everyone of them was a high priced annual subscription. This will give him a notification that he is doing something he may not realize. Isn’t there a Parental Control you can turn on that pings a parent’s device and asks permission be granted before a child can make a purchase? Seems like that would a good way to avert your grandson’s situation. Edit: yup, just checked. Under Family Sharing “Ask to Buy” needs to be activated on the grandson’s account. This is great! So you get an 'inelegant' popup. No worse than all the other iOS popups. I was looking for a very basic, simple weather app for my mini 5 (WHY doesn't Apple include the same on as on the phone?!) and a review mentioned it's START button actually triggers a free trial then subscription. The text telling you this is light grey and TINY, easy to miss. This new 'hoop' is a welcome sack tap to sleazy developers. I like the App Store but Apple needs to work on a decent search engine that actually give the results you're looking for, and when bragging about how many apps are in store, brag how many people they have curating the apps. It should be a number worthy of bragging rights. If Apple is going to tell us their Walled Garden is for our benefit, they should at least put some gunners on the ramparts. I'd settle for archers with long bows. Very good feature. Even better would be if you got a pop up before the first charge was made letting you know the free trial was over and giving you the chance to cancel. They could also require apps to have the option for a monthly subscription rather than the yearly, but then the slimy apps would simply jack up the monthly cost. Yeh, there is. And we tried that early on then turned it off because it didn't work well for us. Essentially the request comes through as an Apple notification and, if you don't respond to it immediately, it just goes away. We were running into too many problems where I missed the notification -- just to approve a $.99 charge. So, we went with the honor system where I asked him to text me for any charges over about $5.00 and that was working well -- until these "free" subscriptions came along.